The deadline for articles, press releases and sponsored White Papers for the next issue of S&T Journal (e-Digest) No.5, Vol.92, May 2008 is 16 May 2008. You can submit your article or press release online. For more information and instructions of preparation click <here>. Special issue on Modern Sensing Technologies of the Sensors and Transducer Journal is primarily focused on the different aspects of design, theoretical analysis, fabrication, characterization and experimentation of different sensing technologies. This 350-page special issue edited by Subhas Chandra Mukhopadhyay and Gourab Sen Gupta comprises 30 papers carefully selected from the extended versions of the reviewed papers which were presented at the the 2nd International Conference on Sensing Technology (ICST 2007), Palmerston North, New Zealand 26-28 November 2007 and published in the conference proceedings. Click <here> for articles downloads. After a few false starts, MEMS-based oscillators are finally beginning to leave the shelves in series. 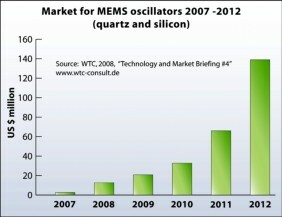 Already last year, close to 3 million MEMS oscillators shipped to end customers, says Munich-based technology analysts WTC - Wicht Technologie Consulting, which recently updated its research on the MEMS answer to quartz timing devices. Three companies are now delivering such devices. Discera and SiTime are manufacturing silicon MEMS oscillators, while Toyocom (part of Seiko Epson) produces micromachined quartz MEMS oscillators leveraging its so-called QMEMS process. 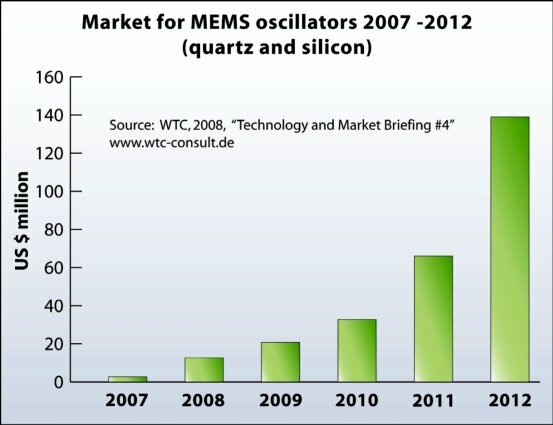 Starting very modestly in 2007 at $2.5 million, WTC believes the market should grow over 120% per year to reach $140 million in 2012, as MEMS equivalents begin to displace quartz oscillators and crystals in more and more segments. While quartz MEMS oscillators has started to replace incumbent quartz oscillators in the high performance TCXO (Temperature Compensated Crystal Oscillators) function for mobile handsets and GPS, silicon MEMS oscillators today compete with quartz in the XO (crystal oscillator) function where the specifications for temperature stability are easier to meet. The first products to incorporate silicon MEMS oscillators are digital TVs and camcorders, but also rear-view cameras use in automotive applications. “We do not believe that silicon MEMS oscillators will have penetrated the 1$ billion TCXO market by 2012,” says Jérémie Bouchaud, head of market research at WTC. “This is due to tough specifications relating to phase noise and temperature compensation. However, we do believe that the best opportunity for MEMS oscillators is with System-on-Chip (SoC) solutions for the replacement of quartz crystals and (PLL) phase lock loop ICs.” MEMS can leverage both the monolithic integration available with CMOS and the possibility to fabricate multiple resonators on one die to make SoC timing chips. This translates into fewer PLLs, better jitter performance and power consumption, and lower cost. “The first products from Discera and SiTime can be described as System-in-Package”, says Bouchaud, “However, Silicon Clocks has positioned itself in SoC MEMS timing solutions from the start. The first commercial samples should be available within a year, with SiTime to follow. MEMS is however not the only technology enabling true SoC timing solutions. With the latest progress on silicon LC oscillator technologies, we believe companies like Mobius Microsystems are also planning single chip solutions to replace quartz crystal and phase lock loop ICs,” said Bouchaud. In addition to the three US start-ups Discera, SiTime and Silicon Clocks, larger companies like NXP and STMicroelectronics are also investing in MEMS oscillators. Another large semiconductor company is developing the technology in stealth mode. Finish research centre VTT, MEMS company VTI and Japan’s Seiko Epson are also noteworthy. Be Sure to Register in Advance For Your Free Expo Hall Pass & SAVE the $75 on-site fee ! Your FREE Expo Pass Gives You Admission to: Unlimited access to nearly 200 key suppliers Event Highlights taking place on the show floor Keynotes & General Session. Upgrade Your Free Expo Hall Pass at the Early Bird Rates -Rates Expire May 2nd* ! *Early bird rates expire May 2, 2008 and cannot be combined with any other offers.